There are plenty of situations when you need know how to operate your computer without your mouse: like that time you kept putting off replacing the batteries on your wireless mouse until that day there was no more juice and you were out of AA's or when you Judge Judy-ed your mouse with your fist-gavel in a 12-year-old-smack-talking-online-multiplayer-opponent-induced fit of rage. Study up on the following tips for navigating your computer without a mouse so that you're prepared for that inevitable dysfunctional wireless mouse at your next big presentation to management. These tips have been written for Windows XP, but should apply to most Windows operating systems, including Vista. 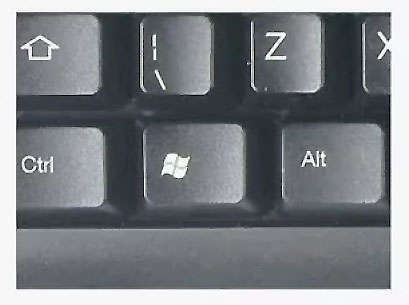 To open a program or folder from your start menu, press the Windows or "start" key (pictured below). If your computer does not have a Windows key hold Ctrl and press Esc. Once the start menu appears you can navigate your choices with your arrow keys or by pressing the first letter in any of the items. If there is only one item in your menu for that letter, that program will launch when you press that letter. For example, if you are trying to open Adobe Photoshop CS2, you could press your "A" key. If it is the only program in your menu starting with "A", then it will launch as soon as you press "A". If there are multiple programs starting with "A", then you will need to press "A" until Adobe Photoshop CS2 is highlighted and press your "Enter" key to launch it. When you have multiple programs open, take note of which one is active. This is indicated by being on top of all other windows and having a dark border. You can toggle which window is on top and active by holding the "Alt" key and pressing "Tab". Continue holding down "Alt" after the first time you press "Tab" to pull up the summary of the available open programs and files shown here. Pressing "Tab" again (still holding "Alt") will cycle through your options one at a time. When a program is your active window, to access the file menus start by hitting "Alt". An underline will appear under one letter of each of the file menu choices (some programs will present this to you differently, such as Microsoft Word 2007). To access any of those menus, hit the letter that is underlined in the file menu title. For example, if you are trying to access the "View" menu in Windows Explorer, hit "V" after you have pressed "Alt". The menu will drop down and you can then navigate your choices using the arrow keys on your keyboard. To select an option in the drop down menu, navigate to it and press "Enter." If Windows Explorer is the active window because you've opened a folder, you can navigate using your arrow keys to select items and the "Enter" key to open them. Press "Backspace" to go back to the folder you were just in. To close the active window or program, save your work if necessary, then hold "Alt" and press "F4". To get back to your desktop when you have programs open, hold down the Windows ("start") key and "D" (for desktop) at the same time. 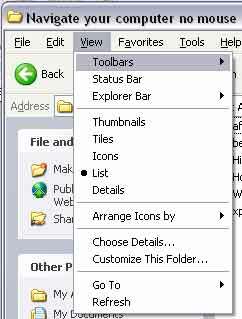 When you are on your desktop, with no open windows, you can navigate the items on your desktop using the arrow keys. You can also jump to files with a specific first letter by pressing the corresponding letter on your keyboard. 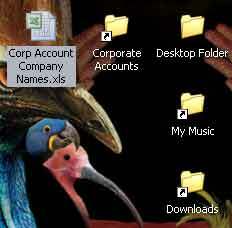 Like the start menu, if you have multiple items starting with that letter on your desktop, focus (shown below) will cycle through those items in alphabetical order, so you may have to press that letter multiple times. If you're not sure how to get to something on a web page or in a program, it's always worth trying the "Tab" key to cycle through items on that web page or program; cycle forward with just "Tab", or cycle backwards by holding down "Shift" and pressing "Tab". In web browsers and Windows Explorer, hold "Alt" and press "D" to access the address bar. Congratulations! You have now protected yourself against rising AA battery prices and prepared yourself for the consequences of your next Halo 3 match.